Discover one of Toronto's most historical and trendy areas by one of the coolest modes of transportation -- a Segway! Take a 30-minute guided tour of the Distillery Historic District and explore its revived Victorian-era industrial buildings and modern sculptures, boutique shops and cafés. Your professional, knowledgeable guide will share interesting facts and stories about this neighborhood as you cruise around the area in style. Your tour concludes with a photo opportunity and smiles extending for days. 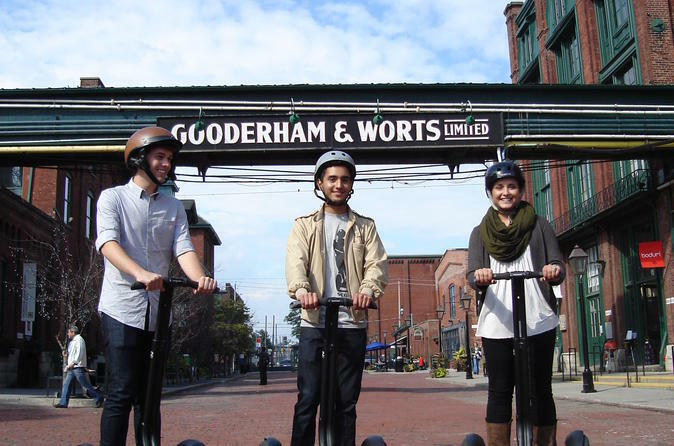 Discover one of the most distinctive neighborhoods in Toronto on this 30-minute tour by Segway! Step back into the 1800s as you tour Toronto's Distillery Historic District with your knowledgeable guide. Your tour will begin with a brief training and practice on the Segway. Traveling on a Segway is a totally unique experience and most riders find them easy to use and lots of fun! Once you feel comfortable on the Segway, your guide will take you through the streets and brick-lined alleyways of the Distillery Historic District. Ten years ago, this area was derelict with abandoned industrial-era buildings. Today, this revitalized area still has its classic historic charm, but also boasts large modern sculptures, including one from the famous Burning Man Festival, as well as trendy boutiques, pubs and cafés. This is a pedestrian-only area, so you will not have to compete with cars as you tour the eclectic sites. Along the way, hear interesting historical facts and stories about the area from your knowledgeable guide.